Regardless of the varying difficulties in various utilize cases, a part of the applications like physical access, distinguishing proof, logical access and employee management can be easily handled by Biometric devices despite different industry type. This adaptability of biometric applications influenced them to check their quality in government as well as private offices. Biometric applications are especially valuable at the spots where a great deal of clients, individuals or guests enters or leaves an office, or require distinguishing proof or check. Nearly all the hospitality ventures like hotels, resorts and casinos can utilize the biometric devices to efficiently provide safe and secure stay to the guests. These establishments face various security issues while making the place comfortable for the guests without causing too much fuss about it. Keeping the establishment secure is a job which requires a certain level of sophistication. If there are too many security checks and stops then the guests can get annoyed. 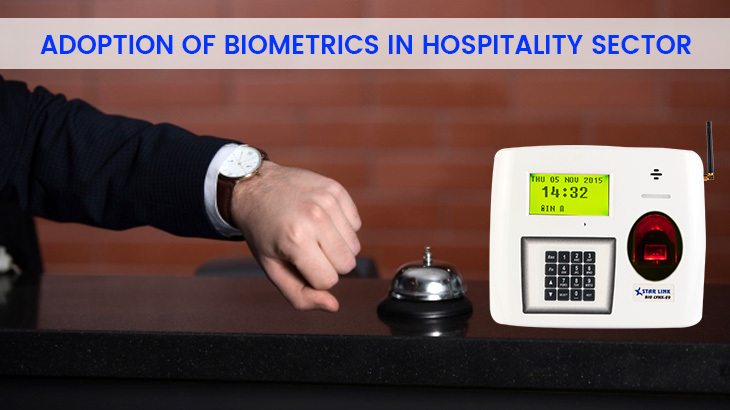 Hence, hotels using biometrics to keep track of their guests and employees are the future of the hospitality sector. Unlike other industries, the customer is the guest at the establishment and cant be treated the same as any other customer. People stay at hotels during the vacation to spend their leisure time and expect comfortable rooms, spas not security checks and stops. With such cut-throat competition in the hospitality sector, hotels don’t want anything to tip off their guests. Hence by using biometric devices in places of human contact, any interference can be avoided. This can be explained with an easy example if a person asks a guest to something like an identification to pass through then they may get angry or act aggressive but when it’s a machine, they won’t react in a similar manner. Biometric devices are already being used in most high-class hotels and various hotels and restaurant owner are welcoming the technology. It is expected that within 5 years facial recognization and biometric can be the key feature of security in the sector. Special Cards or Fingerprint to access to exclusive places. Biometric Check-In with fingerprint and selecting all the necessary requirement. To track and improvise by guest’s preferences. We can also use biometrics in schools in the near future to efficiently track the students and keep the parents assured about their kid’s presence in the classes.